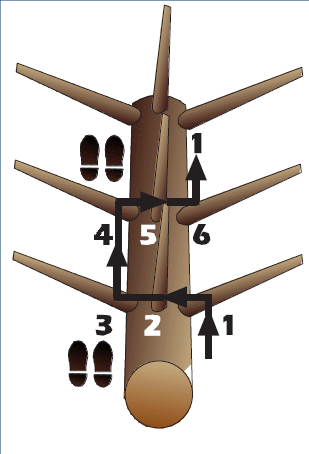 The six-step method illustrated above is a safe, easy and efficient way to limb trees. A 20-year-old woodsworker was fatally injured while limbing a softwood tree with a chainsaw. His saw blade kicked back and the rotating chain struck him in the groin area, severing the femoral artery. The cut was just above the protective padding of his chainsaw pants. The young man died before reaching hospital. 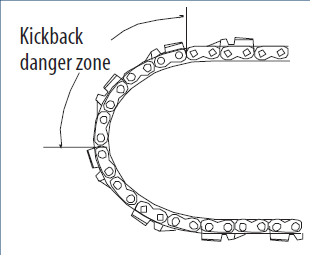 Most kickback incidents occur during limbing and bucking, as they are the operations in which the guidebar tip of the saw is more likely to come in contact with logs and branches. Before you begin limbing and every time you step forward, make sure the guide bar of the saw is on the opposite side of the tree from you. Slide the saw along the trunk. Operate the saw at a height between your knee and hip, whenever possible. This will give you better control of the saw. Stand firmly and limb close to you. Do not put yourself off balance by stretching and overreaching. Let the weight of the saw rest on the tree trunk. Do not support the weight of the saw with your forearms. Never limb with the upper tip of the guide bar. Never use the chain saw with a motion toward yourself while limbing or bucking.